I think people underestimate how important it is to take care of our environment. They think it’s hard and that it doesn’t really matter if they change because other people are not changing. We hide behind what others are doing, but if no one steps up to it, we are doomed. At this point, we should be considering the state of our world an emergency where every piece of trash you produce is diminishing the amount of time our world has left. After doing our trash free challenge, we learned a lot and wanted to share some small things you can do to decrease the amount of trash you produce. The major thing that Team Knit does to produce trash is eat packaged food! It’s very difficult to avoid packaged containers nowadays, especially if you’re eating fast food. So our tip? Eat healthy. Fruits and vegetables are very easy to get unpackaged and the trash from eating such foods is natural compost. Not only are you helping the environment, but you are also helping your body and mind. When you go grocery shopping or buy anything, don’t use plastic bags. Instead, bring your own bags or a backpack. Pack your lunch ahead of time. It helps you avoid buying lunch and therefore, you avoid using lots of plastic. As an added bonus, you can usually save money. Be aware and conscious of what you are doing when you go grocery shopping. While grocery shopping, buy things that aren’t packaged or less packaged than other options. Being conscious of the environment overall with everything you do from drying your hands to buying food can help you protect the environment. When you are about to purchase something, think about how you are affecting everyone’s future planet. Although this wasn’t in the video, it’s something I try to do most of the time. After washing them, air dry your hands instead of using paper towels. If you end up using paper towels, remember one is enough! Soon, it will be too late to reverse all the damage we are causing to the environment. Although there are alternate options like recycling, many of the trash we use can not be recycled or recycling centers are overloaded (National Geographic). The best solution at this point is just to produce less trash. We also have other issues to be worried about such as fuel emissions which are deteriorating the layers of our atmosphere causing global warming that hurts plants, animals, sea levels and basically anything you can think of. Minimizing the amount of trash you produce is just one small thing you can do to help our environment. 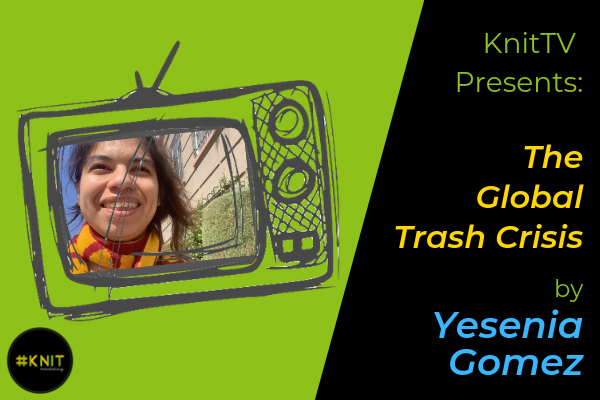 This Earth Day, go trash free! As a team that is focused around youth, we beg you to help us by changing your habits because we want a better future and we want generations after us to enjoy the nature and beauty we have seen. Happy Earth Day from us at Knit Marketing!